bike and pedestrian routes. After all, car drivers are usually moving too fast to encourage up close lingering and reflection on budding plants and garden art. 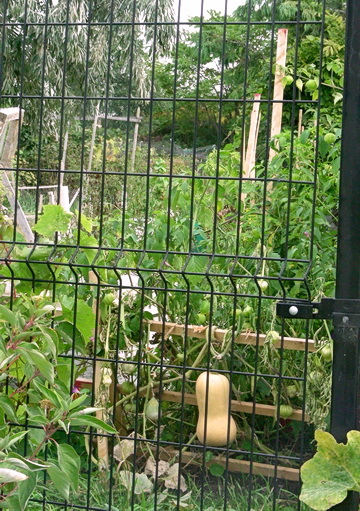 Sample approaches of community gardens in relation to active transportation routes, will be highlighted for cities of Toronto, Vancouver and Calgary. Fifteen years ago, before community gardens became the blooming rage for growing local food and flowers, I used to cycle to work daily and pass a large community garden along Toronto’s Waterfront bike route –not far from the Leslie St. spit. At that time, this garden had a low wire fence where one could look over top to see a profusion of plants, compost piles and garden lawn chairs scattered about for resting. bushes. Most likely, the choice location wasn’t because of the bike path location. It was the reality, that sometimes people could drive and stop briefly to unload soil and other gardening tools. Besides, the location was on a convenient plot of public land across from a light industrial area that continues to have flotillas of trucks rumbling on the road. Thank goodness for a marked bike and walking route. Without the Leslie St. allotment gardens and signed pathway, this area would be dull, bleak and an area to avoid. 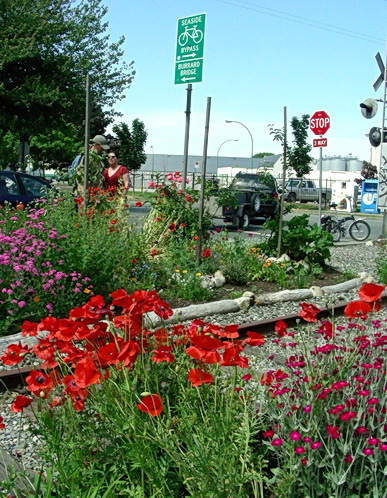 Some Vancouver community gardens display creative reclamation of abandoned public right of ways and other underused land plots, such as traffic calming circles. Just a 5-minute walk from the Granville Public Market, lst Ave. near Fir St., are recent new community gardens lining the abandoned Molson branch rail line from the Arbutus Corridor, another abandoned rail line. You can’t help but stop by to marvel bright red poppies, miniature tongue-in-cheek, homemade transmission line art and jewel-coloured floral annuals dotting decorative grasses, ground cover plants and some veggies, including tomatoes. It’s a brave garden: it has no fencing –yet. There’s even an arbour built right by the rail crossing sign. Certainly cyclists have to slow down anyway to look, in order to angle their wheels safely across the rail line. One of several traffic calming circles containing community gardens. 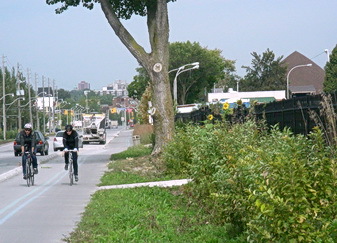 Ontario St. bike route, Vancouver BC 2010. Photo by J. Chong. A road centrepiece that slows down cars, cyclists and pedestrians. 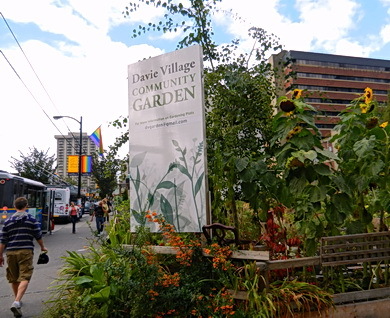 After cycling another 10 minutes north on the separated bike lane via the Burrard St. Bridge, you will reach the Davie Village garden. This community garden is planted right in the heart of downtown Vancouver, at a street corner thronging with people, car traffic, buses and bikes during the day. The garden has overtaken land where there was once a gas station. The land was specially prepared to contain soil contamination for gardening on top. There, sunflowers rise like smiling, calm faces to greet the harried crowds and traffic. The City of Vancouver had only discovered within the last few years, that its cycling network had some major routes close to a wide range of community gardens. Here are maps that combine its bike routes and community gardens. 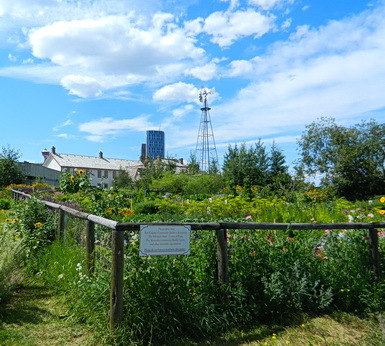 Community garden behind Fort Calgary, historic former Northwest Mounted Police site. Along Riverside bike-pedestrian path by Bow River. Calgary, AB 2011. Photo by HJEH Becker. degrees latitude north of Toronto. While Vancouver has over 2,500 community garden plots, Calgary has 30 community gardens with over 115 garden plot allotments. weren’t for the occasional concert and staging area for annual Calgary Stampede, this flat prairie parkland is otherwise underused. The community garden is a bright spot under the blazing hot, naked sun. As you continue along the path and near the heritage Simmons Bedding Factory which now house architectural offices, there are temporary community gardens in the rising, rehabilitated East Village area. The gardens pop cheerfully and humbly amongst the construction flurry of condos, a new Central Library and more. 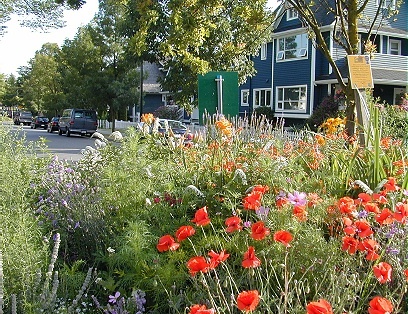 Community gardens and bike-pedestrian routes, if well-positioned and integrated into community design, enhance neighbourhood property values, health of its residents, and promote conviviality among people in shared outdoor activities. Calgary Horticultural Society. Community Gardens. List provided with links. Chong, Jean. People’s Oases: Community Gardens. In Cycle Write Blog. Apr. 9, 2010. Chong, Jean. Touring Vancouver’s Community Gardens Along its Bike Route. In Velo-city Global 2012 Conference Blog. Apr. 15, 2011. Includes community gardens on front lawn of Vancouver City Hall. City of Vancouver. Community Garden Walking and Cycling Tours. Includes maps. 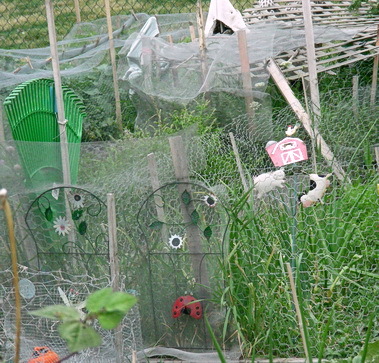 Toronto Community Garden Network. 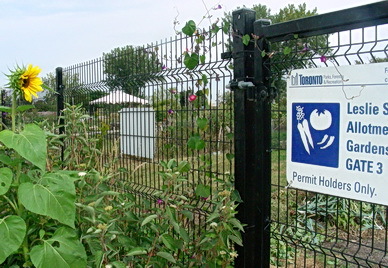 Community Gardens in Toronto and GTA. For unknown reasons, Leslie St. Allotment Gardens are not on this list. A very lyrical post, and you’re an excellent photographer. I especially like that going-away perspective shot by the old railroad bed. Lovely. These gardens by the rail line bed, are great to see since often railway crossings (for active or abandoned rail lines) look abit visually messy and “industrial”. It’s a great simple streetscaping touch and no cost, since it’s proud gardeners reusing land for a good purpose and showcasing their work also. Happy cycling near gardens in full blossom! There’s nothing like a clear blue sky, with a palette of flowers to make for a great cycle ride. Thanks for the good wishes. Hopefully your area has such gardens to brighten public space! Wow Jean, reading this post brings back so many nice memories! I remember biking 2 years ago from Montreal Downtown to the Old Port of Montreal through the Lachine Canal. I can’t bike too often in such places; I get so captivated by the view that I don’t look in front of me (reckless biker). I also remember biking in Ottawa with beautiful gardens on one side and the Ottawa river on the other side. It was memorable, I wish I could do that everyday. One of the pictures I like the most is the one of the Molson rail branch line in Vancouver. It reminded me how excited I was when I saw elevated gardens in New York (http://www.oudolf.com/userfiles/file/new-york-hanging-gardens.pdf). An original way to make use of an old railroad. I’m quite familiar with Toronto Downtown but I need to try their bike path. I have never been to Calgary but Vancouver is my priority. I know I can fall in love with this city. Seeing these pictures reinforces this conviction! Hisbiscusjaune: Though you weren’t able to reference what was in Montreal, thanks for the link for this particular NYC gardens. Good use of what be otherwise, derelict public space or infrastructure. I’m sure you’ll get to Vancouver one day, just try June to Sept. so that you’ll see its wonders without alot of rain. 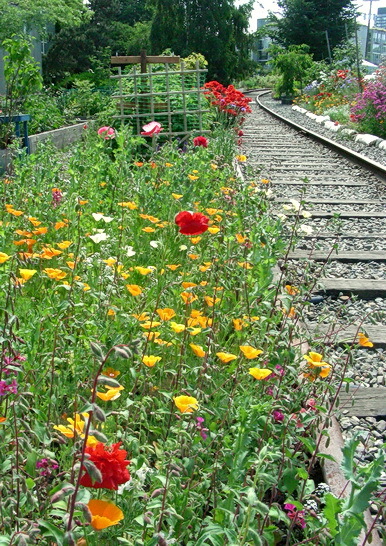 🙂 The Molson rail line gardens is favourite too with the red poppies and just the fact of where it exists.